Willie Nelson and Miranda Lambert make guest appearances on the impassioned album. Steve Earle’s music echoes so many timeless sources that it’s tempting to reduce him to shorthand descriptions—he could be Hank Williams fronting the Stones, or a cross between Merle Haggard and Bruce Springsteen. But mainly he sounds like himself on the rousing So You Wannabe an Outlaw, chugging through a two-fisted set of tough-but-tender songs about struggle, heartbreak and occasional hope. From the stomping title track, guest starring Willie Nelson, to the lilting “This Is How It Ends,” featuring Miranda Lambert, to the honky-tonk swing of “Walkin’ in LA,” these songs crackle with rowdy energy and rueful wit, providing the perfect backdrop for his scuffed-up, seen-it-all vocals. 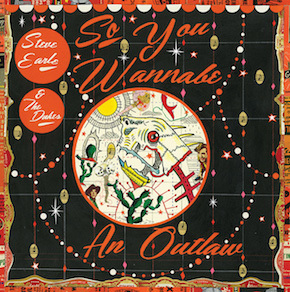 The only thing boring about Steve Earle is his consistency: He’s always terrific.